PI324. 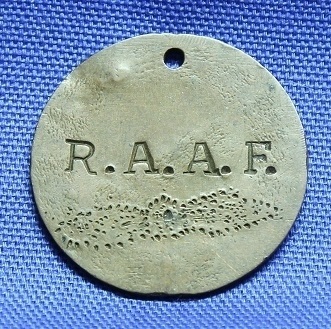 An unofficial identification disc, possibly made from a penny stamped 39900 MUNDON CRESDEE with R.A.A.F. and a stylised propeller on the back. Kenneth Hilmas Mundon-Cresdee enlisted on 5 Aug 1941 at Adelaide and discharged on 25 Jan 1946 as a Warrant Officer from 9 Aircrew Holding Unit. Kenneth was killed in a motor cycle accident on 24 Jul 1948 aged 27. PI324. 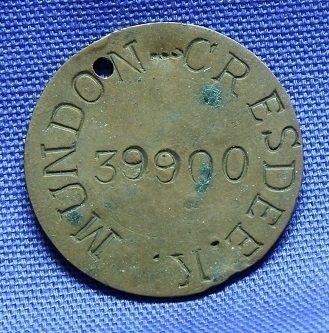 An unofficial identification disc, possibly made from a penny stamped 39900 MUNDON CRESDEE with R.A.A.F. and a stylised propeller on the back. PI330. 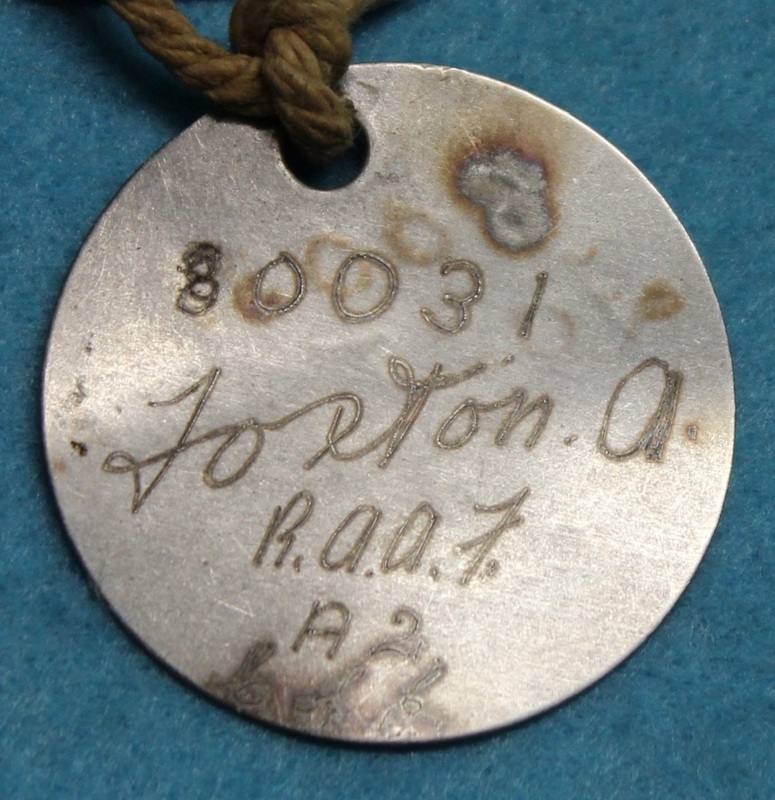 A pair of official identity discs engraved 72885 Cather M. C. RAAF C of E. Maxwell Clive Cather enlisted on 17 Nov 1942 at Wellington and discharged on 1 Dec 1976 as a Warrant Officer. PI331. 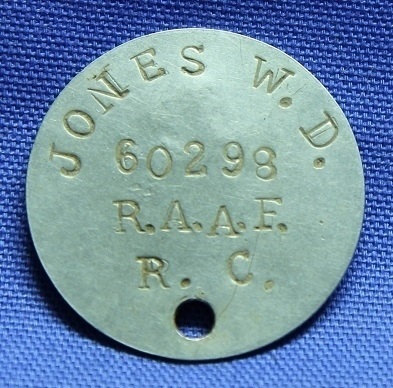 A single circular identity disc stamped Jones W. D. 60298 R.A.A.F. R. C. B3. William Douglas Jones enlisted on 5 Aug 1941 at Westmead and discharged on 22 Nov 1945 as a Corporal from 34 Squadron. PI332. 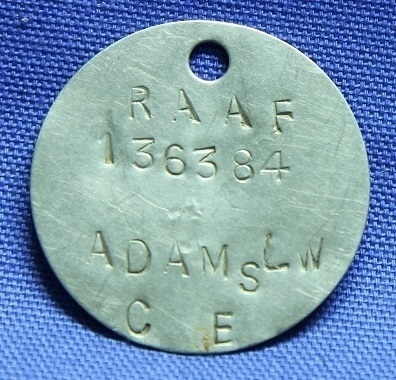 A single circular identity disc stamped RAAF 136384 Adams L W C E A2. Leslie William Adams enlisted on 13 Aug 1943 at Bomaderry and discharged on 8 May 1946 as a Leading Aircraftman from 5 RAAF Hospital. PI333. 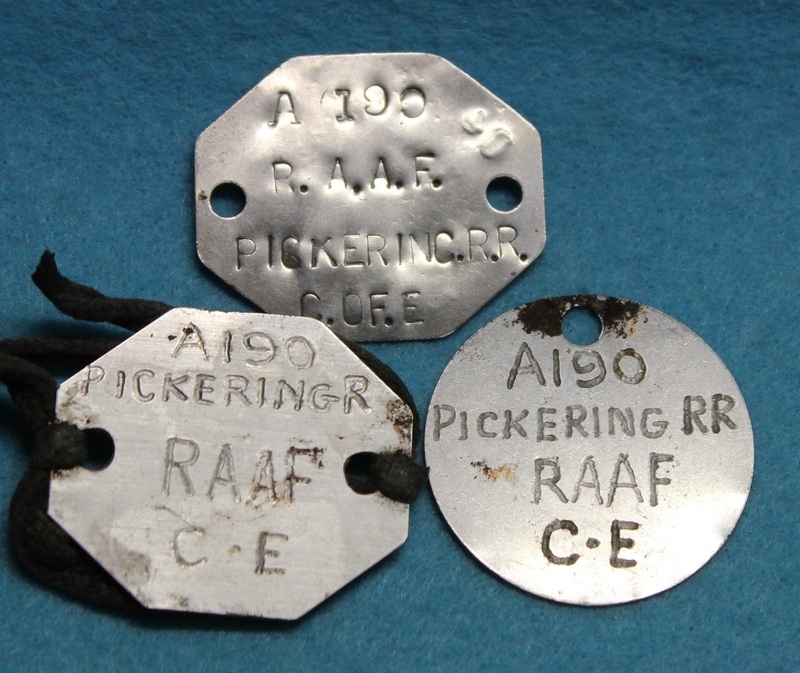 3 post war identity discs engraved A190 Pickering R R RAAF C E.
PI334. 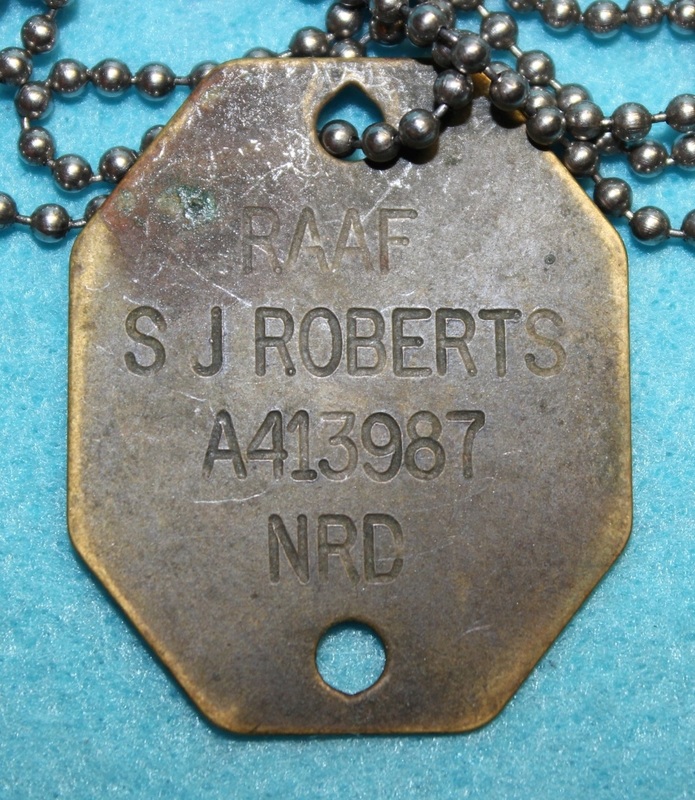 A single official identity disc engraved RAAF S J ROBERTS A413987 NRD. PI336. 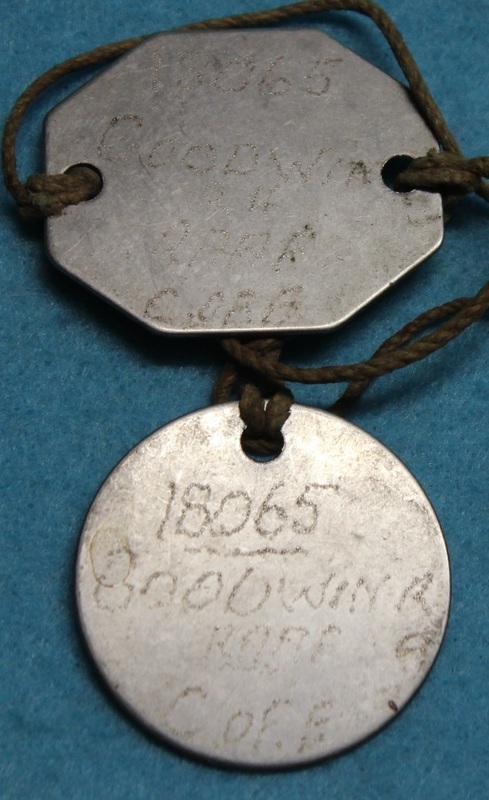 A pair of official identity discs engraved 18065 GOODWIN R H RAAF C of E. Reginald Alfred Goodwin enlisted on 19 Aug 1940 at Melbourne and discharged on 21 Nov 1945 as a Corporal from 2 Reserve Personnel Pool. PI341. 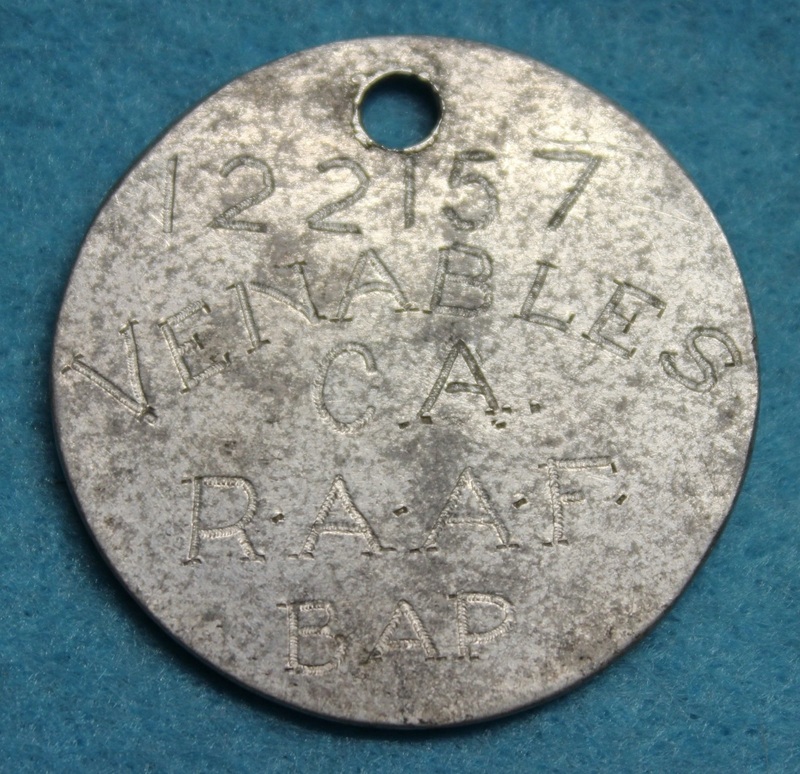 A single circular identity disc engraved 122157 VENABLES C A RAAF BAP. Cyril Albert Venables enlisted on 20 Jan 1943 and died in a flying accident in Fairy Battle L-5654 on 27 Aug 1943 at 2 Bomb and Gunnery School Port Pirie. PI345. 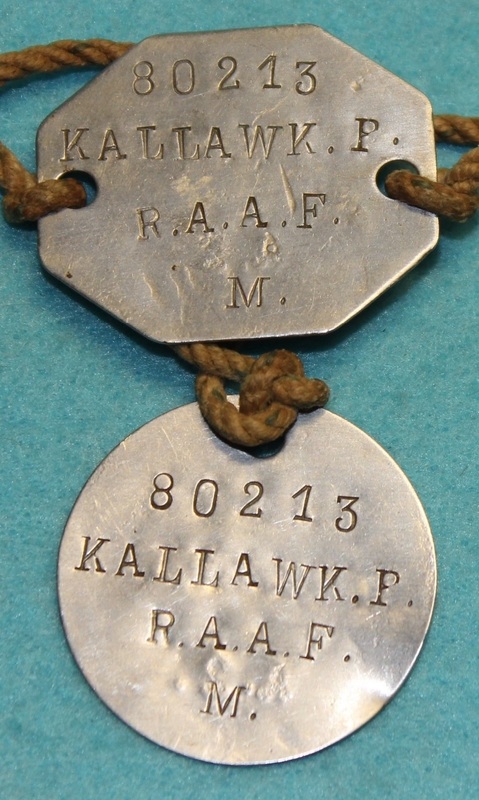 A pair of official identity discs stamped 80213 KALLAWK F. R.A.A.F. M. Percy Kallawk enlisted on 14 Apr 1942 at Perth and discharged on 5 Feb 1944 as a Leading Aircraftman from 5 Embarkation Depot Subiaco. PI347. 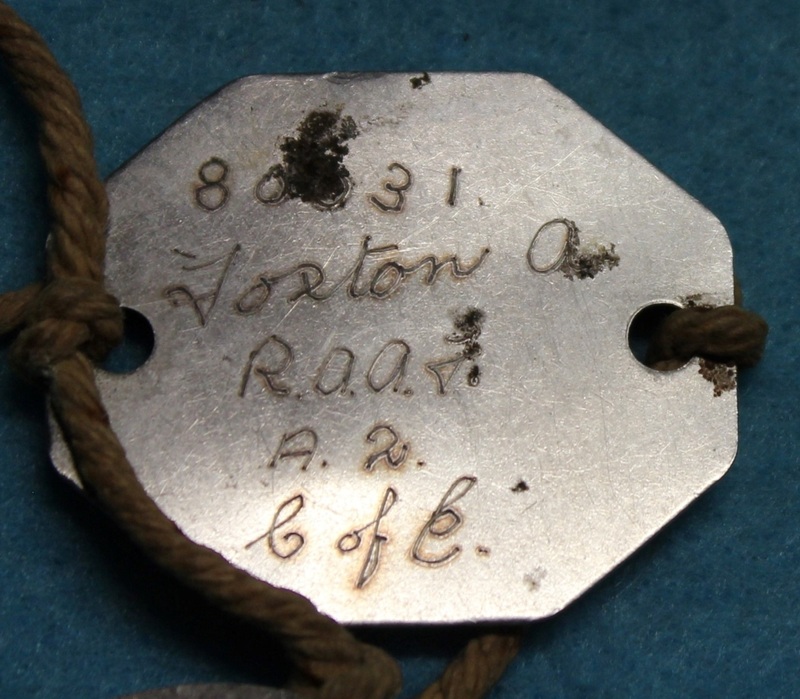 A pair of official identity discs engraved 80031 FOXTON A R.A.A.F. A2 CE. Alan Foxton enlisted on 31 Mar 1942 at Perth and discharged on 18 Dec 1945 as a Leading Aircraftman from 4 Aircraft Depot. PI351. 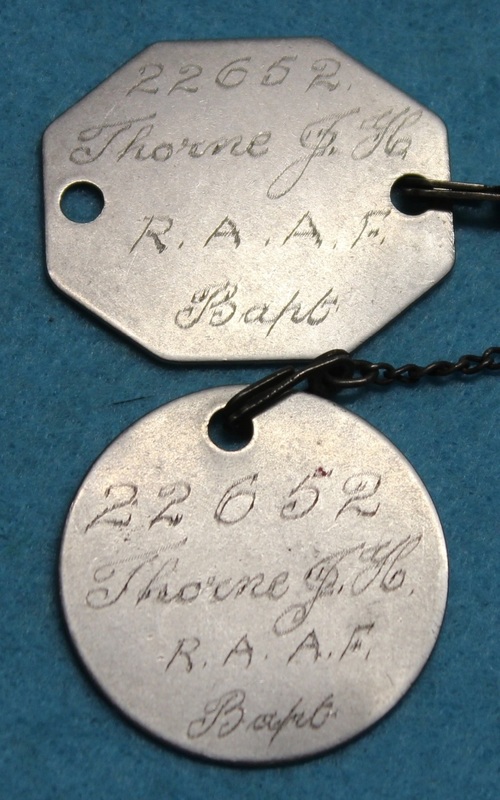 A pair of official identity discs engraved 22652 THORNE J. H. R.A.A.F Bapt. John Henry Thorne enlisted on 10 Jun 1940 at Brisbane and discharged on 14 Dec 1945 as a Corporal from 14 Operational Base Unit. PI361. 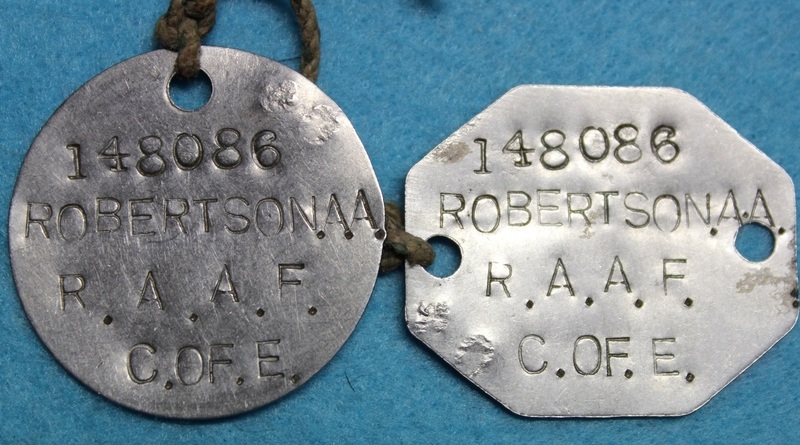 A pair of official identity discs stamped 148086 Robertson A. A. R.A.A.F. C of E. Alexander Alfred Robertson enlisted on 22 Mar 1944 at Melbourne and discharged on 28 Feb 1945 as a Aircraftman 1 from 5 MED REA U.
PI363. 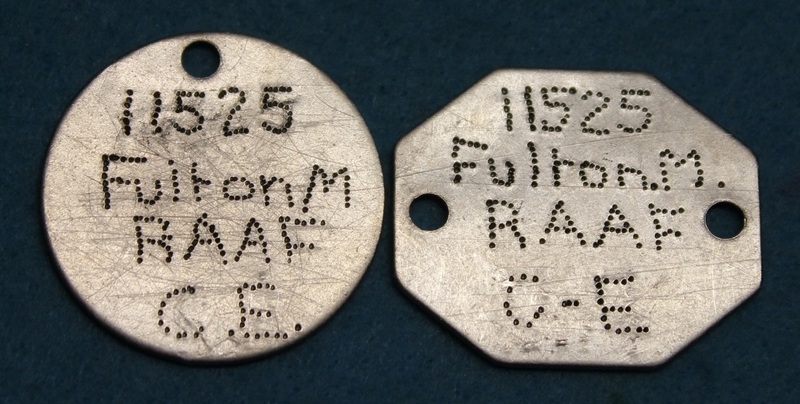 A pair of official identity discs engraved 11525 Fulton M. RAAF C-E. Malcolm William Fulton enlisted on 1 Aug 1940 at Melbourne and discharged on 17 Nov 1945 as a Warrant Officer from 2 Personnel Depot. PI366. A single hexagonal identity disc engraved 14752 A.C.1. 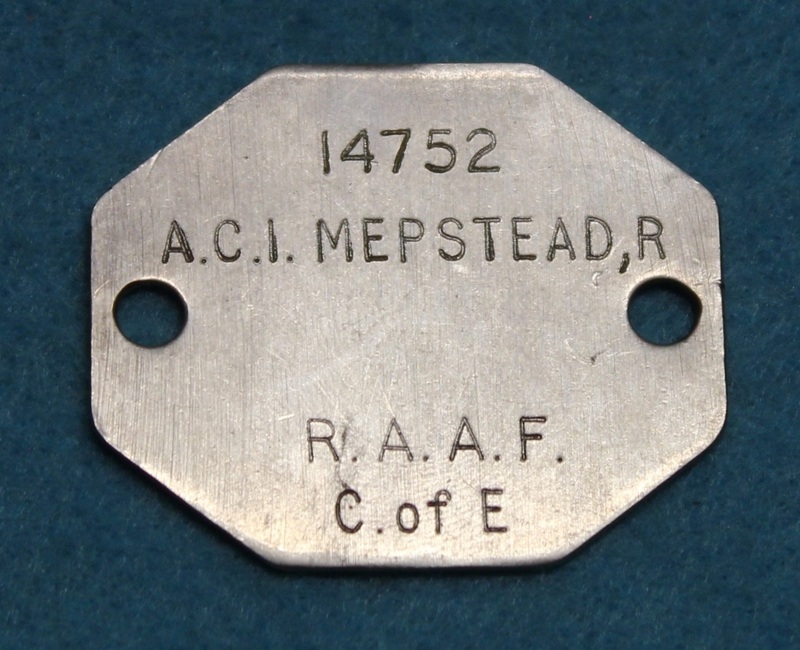 Mepstead R. R.A.A.F. C of E. Richard Horton Andrew Mepstead enlisted on 29 Apr 1940 at Sydney and discharged on 21 Sep 1945 as a Sergeant from 7 RAAF Hospital (Staff). PI367. 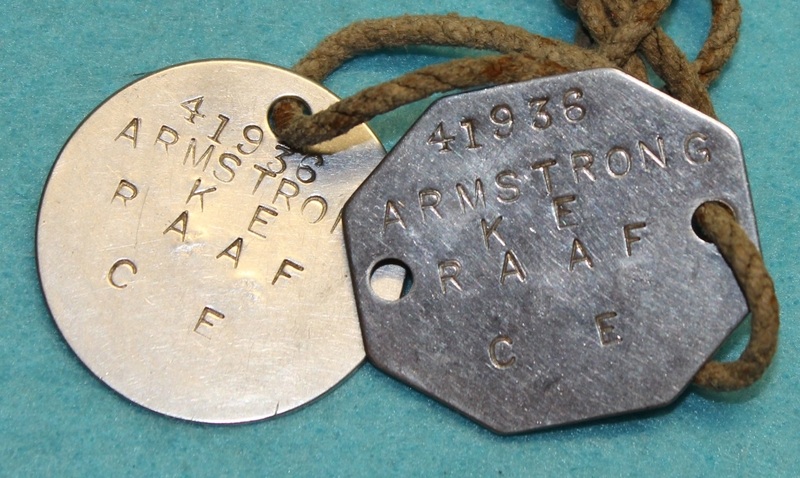 A pair of official identity discs stamped 41936 Armstrong K E RAAF CE. Kenneth Edgar Armstrong enlisted on 28 Jul 1941 at Melbourne and discharged on 9 Jan 1946 as a Corporal from 93 Squadron. PI368. 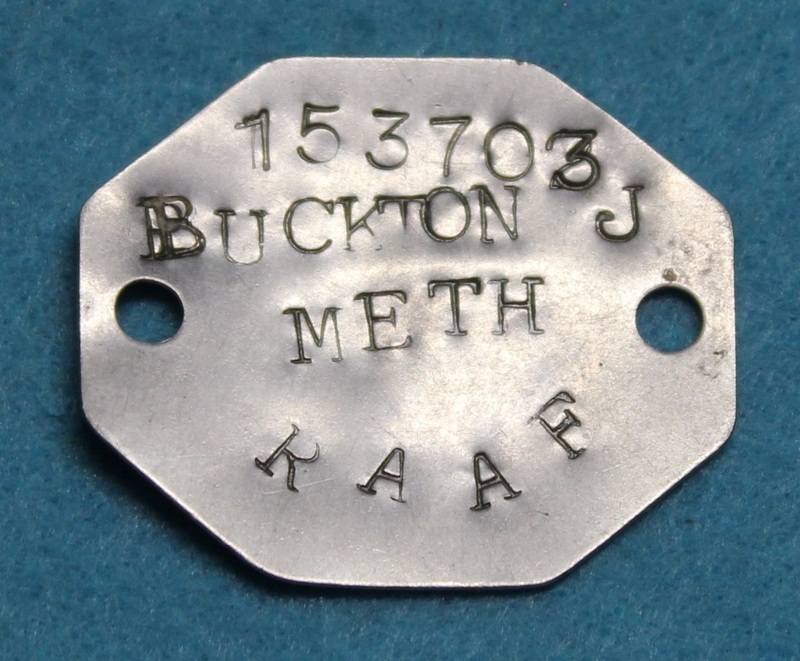 A single hexagonal identity disc stamped 153703 Buckton J METH RAAF. Jack Buckton enlisted on 14 Sep 1944 at Adelaide and discharged on 18 Apr 1946 as a Leading Aircraftman from 12 Aircraft Repair Depot.